We'd been hoping this year to see Honu, as we've named the sea turtle who we watched swimming in a nearby lagoon last year. 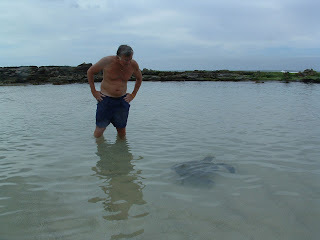 Honu is the Hawaiian word for turtle, by the way, not just some clever name we gave the big guy. And our recent stormy weather has kept the wave action so high that we'd about given up on seeing our old friend. Wednesday morning we had a calm - before the storm - in a manner of speaking and we set off to explore a new-to-us lagoon a bit further down the road. Our new discovery was reached by a sandy beach access path between the private Campbell Estate and Paradise Cove luau headquarters at Ko Olina, on O'ahu's west coast. The lagoon is one of three natural lagoons on the property - we'd just never gotten to it on earlier visits.The crescent sand beach was nearly empty - only two other couples and a family of four - all of whom were busy watching Honu! It may have been our same Honu or a distant cousin - whatever the case he was a 3-legged honu, unlike the turtle we watched last year. I am happy to report that all we tourists obeyed the rules posted on beach to stay back and not bother the turtles. Honu hadn't read the signs: he swam right up to us . . .sending children screaming from the water and keeping the rest of us entertained by his curiosity.